Reason 1: Wow, what a portrait! 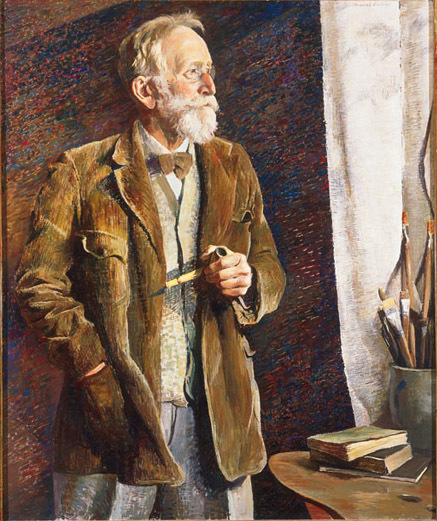 It’s a picture of William L. Lathrop by Daniel Garber, two of the most famous Bucks County painters. Garber made this painting only three years before Lathrop died, and later spoke fondly of the stories Lathrop told while Garber was sketching him, stories about Lathrop’s many friendships with some of the legendary American landscape painters. Reason 2: Lathrop and his wife, Annie, more than anyone else, were responsible for the birth, growth, and nurturing of the art colony in New Hope that became such an important part of the story of American impressionism. The Michener Art Museum was founded by people who loved the work of the historic New Hope artists, so you might not be standing here reading this label if Lathrop hadn’t decided to live in Bucks County. Daniel Garber (1880-1958), William Langson Lathrop (1859-1938), 1935, oil on canvas, H. 50 x W. 41 7/8 inches. Courtesy of the Pennsylvania Academy of the Fine Arts, Philadelphia. Joseph E. Temple Fund, 1936.5.